Rob Marshall's Pirates of the Caribbean: On Stranger Tides is arguably the movie most of us thought we were getting back in summer 2003 with Pirates of the Caribbean: Curse of the Black Pearl. It is a weightless, thoughtless, undisciplined, and juvenile bore. It replaces plot and character with non-stop frantic action that provides little entertainment value because there are no clear stakes. Unlike the first picture, it gives us no characters worth caring about and no story worth following. Unlike the bloated but surreal, challenging, and ambitious sequels, it lacks any kind of cinematic life, feeling less like a big-screen extension of the mythology than a made-for-TV pilot reboot. It is the very definition of half-assed cash-in. 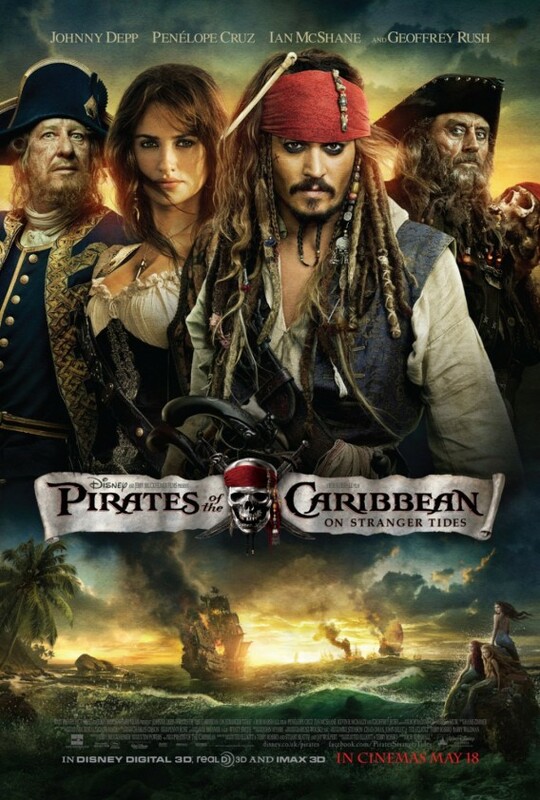 Eight summers ago, the initial exploits of Will Turner, Elizabeth Swann, and Jack Sparrow surprised us by being a real film that happened to be based on a Disney theme-park ride. This fourth installment can't even hold a candle to The Haunted Mansion or The Country Bears. A token amount of plot: Will and Elizabeth Turner have found their ten-year delayed happy ending (the epilogue in At World's End implied that Will's curse would be broken if Elizabeth stayed faithful), so Orlando Bloom and Keira Knightley are nowhere to be found (and very much missed). As such, comic supporting foil Jack Sparrow (the sad and embarrassed Johnny Depp) is promoted to the would-be heroic lead this time around. As hinted at in the third film's finale, this picture centers on a quest for the Fountain of Youth. While Sparrow seemed set on finding it at the end of that film, here he has no interest until he is shanghaied by the fearsome Blackbeard (Ian McShane) and his daughter Angelica (Penelope Cruz). Also racing to find this fabled treasure is Sparrow's old friend/nemesis Captain Barbossa (Geoffrey Rush), who has given up his pirate ways and has been hired by England, along with a fleet from Spain. Mixed into this quest is the noble pastor Philip (Sam Caflin), who becomes torn after Blackbeard begins kidnapping mermaids in order to extract their tears (which is key to finding the treasure). Alas, my fears of Jack Sparrow: ROMANTIC LEAD/ACTION HERO are relatively true (think a Shrek sequel starring Donkey). Frankly, the daffy Jack Sparrow had already worn out his welcome by the third picture, as the return of Barbossa provided the gritty comic relief that was more appropriate for the dark and bleak finale (killed off at the conclusion of Dead Man's Chest, Jack should have stayed dead). Sparrow is forced to dial back his off-the-cuff absurdities and observations, and most of his wacky behavior consists of merely taking pratfalls from very long heights. His would-be romantic past with Anglica is constantly referenced and emphasized in dialogue but never shown or convincingly displayed. With no chemistry between Depp and Cruz, one can only presume that it's romance-by studio demand. It's either because someone high up said 'Let's give him a girl this time!' or Disney execs were somehow concerned that conservative audiences were taking Depp's 'Jack Sparrow is gay!' comments seriously. Despite his star-turn this time around, Depp oddly finds himself absent or on the sidelines for much of the picture and with no real role in the overall outcome of the story. It's as if Depp politely reminded everyone once on set that Sparrow was not the lead character (at best, he's the Han Solo of the series), and no real backup plan was in place. Besides, the film already has a halfhearted romantic subplot, as Phillip finds himself falling for a captured mermaid (Astrid Berges-Frisbey) in an obvious case of "Gee, we need some random young heartthrobs to put on a poster since Bloom and Knightley aren't around!". Blackbeard is a dreadfully dull villain, constantly exclaiming his own evil but rarely acting on it. McShane certainly can't compete with the sexually-threatening charm of Geoffrey Rush's original Barbossa and the oozing anger of Bill Nighy's Davey Jones (sadly, Nighy gave a better performance with only his eyes than McShane gives without any special effects impediments). As for Barbossa, Rush is almost as neutered as Jack this time around. Although the film very briefly comes to life during a brief moment where Jack and Hector are reunited for a common goal, and you'll find yourself wishing that Disney just did a buddy picture with Depp and Rush. Berges-Frisbey plays imperiled and Caflin does noble, faith-based romantic, but charm escapes both of them throughout. Even Cruz, stuck having to swoon and flirt with a character with whom she has no chemistry, fares poorly here, shows once again how often American filmmakers cast her purely as a piece of meat. We're constantly told that she is a rough-and-tumble pirate who is as tricky as she is beautiful, but she cannot hold a candle to Elizabeth Turner's fleshed-out piracy. Frankly, she is yet another 'strong willed, independent, feisty' female lead who is constantly at the mercy of the men throughout the film. Despite their reputation as full-on adventure pictures, none of Gore Verbinski's Pirates of the Caribbean films are what anyone would consider non-stop action. Each film has around three major set pieces inside a 2-3 hours worth of story and character development. In fact, if there was anything that the first three films were known for, it was their overabundance of plot. While everyone swore this one would be simpler, the film is still endlessly padded with various subplots and/or rules that stretch out the film by a good third. Much of the dialogue consists of exposition, either of the plot up to now, the plot going forward, or the various intricacies that must be acknowledged. The rest is painfully on-the-nose character exposition that painfully states the character arcs that our heroes and villains are allegedly partaking in. I'd blame screenwriters Ted Elliott and Terry Rossio, but the film feels so unlike the previous three films that I can only presume that directorial mismanagement and/or studio edict played the key role in the lifeless storytelling (oh how I hope they chime in for a commentary on the DVD, as they did with parts I and II). And in the place of knotty narrative, twisty character turns, and sliding scales of morality is mere incident. Chases, fights, escapes, and unimpressive action carry the day, with none of the theatrical verve that Verbinski brought to the set pieces back in the day. There is nothing in this film that equals the unending sword fight atop a giant spinning wheel in Dead Man's Chest, or the epic rain-soaked battle at sea in the finale of At World's End, or even the character-driven sword-fight meetup between Will Turner and Jack Sparrow in the opening act of Curse of the Black Pearl. Ironically, it is in the action scenes that Marshall's musical background becomes a hindrance. Like any number of musicals, the film stops dead in its narrative tracks whenever an action sequence is required, only to often pick back up again with little of consequence having occurred. It's no secret that I think Marshall is an overrated filmmaker, having got by on the talents of his actors (Renée Zellweger, Catherine Zeta-Jones, Richard Gere, Queen Latifah, John C. Reilly, etc) and writer Bill Condon in Chicago and then botched Memoirs of a Geisha and Nine. But his bare competence here is truly shocking. While there is a token amount of practical stunt work, there is no imaginative staging or blocking for any of the pointless action sequences on display. We have a complete lack of visual poetry in a big budget adventure film set in a jungle. We have the entire film, perhaps due to shooting in 3D video, looking like ugly high-def. Most of the film takes place at night, so I can only imagine how much darker and uglier it looks in 3D. Gone are the rich colors and vibrant cinematography from the previous films, replaced with murky grays and ugly hues. Again, one could blame Dariusz Wolski, but he also shot the previous three films, so one can only wonder why this film looks and feels like a direct-to-DVD spin-off of the prior trilogy (perhaps, again, shooting on location with the 3D Red camera was an issue). Say what you will about the original Pirates of the Caribbean films, but they were artistically inspired bits of popcorn entertainment. They were filled with high adventure, multi-dimensional characters, an overstuffed plot (that still more-or-less made sense), and an amorality that set it apart from the usual blockbuster fare. The original trilogy was only guilty of trying too much, of having more movie than perhaps we are accustomed to (it may have also been a War-On-Terror metaphor, natch). So while the original films were flawed, their flaws were born out of artistic ambition and experimentation. Pirates of the Caribbean: On Stranger Tides is a film born of laziness, half-hearted check-cashing, and borderline incompetence. It turns wild-card Jack Sparrow into a borderline straight man and gives him no one to bounce off of. It replaces two romantic leads who some (wrongly) claimed were dull with an entire cast of dullards. It is the first film of the series that truly feels like it was based off a theme park attraction, and it is about as exciting as an episode of Disney's Jake and the Neverland Pirates. Note: Am I harsher on this film because Disney has tried to sell this film by bashing the previous films and convincing those of us who enjoyed them that we were mistaken? Damn right I am. Am I harsher on this film because Disney has been implicitly trashing original director Gore Verbinski in order to sell Rob Marshall as an upgrade? Damn right I am. You don't trash the previous films in a given series as a means of selling audiences on the next sequel only to deliver a machine-produced piece of thoughtless, witless, audience-insulting garbage that does nothing more than make you feel guilty for ever saying a harsh word about Dead Man's Chest or At World's End. It is a clear case of failing to try, and its likely blockbuster success is a clear case of audiences being taken for granted. I'll ending up watching this on video eventually (not impressed enough with the trailer to bother with the theatre) but I doubt I'll miss Knightly. Cute as a button but usually a debatable actress, at best. There is something fundamentally enjoyable about reading a review from a reviewer who's having a great time trashing a film - I loved reading this review. I have to heartily agree with this assessment. I stand as one of the few who actually kinda enjoyed At World's End. In all three previous films I couldn't stand either Knightley or Bloom and I was surprised how much I missed them in this film. I had no affinity for any of these characters, bar Sparrow and Barbossa and that's really only cause we knew those two characters well. The thing I missed most in this movie were the crew of the Black Pearl. While, they were never big parts of the originals, they helped continuity through the series and always led to some comic moments...which were sorely lacking here. Upon re-watching the originals I haven't liked them anywhere as much as I did before, but they were fun. This wasn't. It fails on all counts. I appreciate the kind words, but I don't try to take too much glee/satisfaction when panning movies. Most bad movies are a cause for sadness/disappointment. Sometimes though, such as here, the almost arrogant lack of quality on display genuinely makes me angry. And again, the fact that Disney and Depp and the gang have been slamming the previous sequels only makes this one's utter failure all the more blood boiling. Perhaps I was too flip; I realistically meant that watching your anger / frustration / disappointment boil over in a review form made for much better reading than if you simply didn't care as passionately as you do and wrote a basic review saying "this wasn't that good". I took no offense. I do try to treat every review as a serious discussion of its worth as a piece of art. Makes it harder for me to be funny, but I try to stay away from the easy path of petty snark and 1st-grade sarcasm. "...epilogue in At World's End implied that Will's curse would be broken if Elizabeth stayed faithful"
No No NO!!! NOWHERE in the movies is it implied that the curse would 'broken' if Elizabeth stayed faithful. Any and all attempts to shoehorn that Disney happily-ever-after ending into POTC3 ignores the plainly stated - not once, not twice, not 4 times but every single time it's referred to - eternity of ferrying souls to the other side, broken every 10 years by one day ashore. Yeah yeah, I've read that retrofit to appease the romantics who want the happy ending. I reiterate - NOWHERE in the movie (which has to stay the 'official' record unless you want to go to FanFicLand) is there ANY indication that after 10 years Will can just stop being Flying Dutchman captain and go home. None. Zero. Zip. Nada. I should start off by saying that I intensely disliked the second and third "Pirates" film. They struck me as overdone, painfully long, and desperately full of double-crosses and twists and turns in the plots used as a means to take up time between tedious action scenes. Both of those films struck me as being overly convoluted, but in a dumb and superficial way instead of a thematically rich or complicated character-driven way. In comparison to the last two films, I did find the fourth film to be simpler in plot and more entertaining because the story was more straight forward. In a lot of ways the film is on auto-pilot in terms of some of the elements you mentioned including the new love interest, the two pretty supporting romantic characters, and the presence of characters from the previous films. Personally, I didn't have a problem with any of these predictable parts of the film and I enjoyed the movie as a unoriginal, silly, and fun summer movie. Basically, yes, the movie is bad, derivative, and you were on the mark by noting that it's a prime example of a studio-mentality looking to cash in on every angle. I still liked it despite the many poor qualities, and the sold out crowd I saw it with during the day actually clapped after the movie ended. Something I was thinking about during the movie, but haven't bothered to really reflect on is the near artistic tragedy of the series (I know, dramatic words). By artistic tragedy, I mean that the franchise has had the potential to be something greater than it has been and ever will be. The first film was mainly original in the fact that the main character Sparrow was so goofy, fey, and bizarrely apathetic about so much of what was going on around him. In most summer blockbusters, the main character is a superhero type of severity and muscle, and Depp's performance was so awesomely in contrast to that typical archetype. Since the first film, the franchise has poorly built off that unique quality. The series has also been so disappointing in the way that some of the world's (yes, not the country's, but the world's) best characters including Nighy and McShane appear in these movies and are so poorly used by the weak scripts. Anyways, I've babbled on enough. Great review by the way, and I look forward to whatever reviews you'll post next weekend. Can you provide a link to where Disney and Depp had slammed the previous sequels? Not saying I don't believe it. I'd just like to know. "sadly, Nighy gave a better performance with only his eyes than McShane gives without any special effects impediments"--brilliantly written! That is ridiculous of him to say that. I'd say that Rango felt more like a Pirates film than this. Also, look at it this way. Down the road they may share regrets about this installment. Like how Shia LaBeouf said Transformers 2 was Michael Bay's best film before release, and then during preproduction for Transformers 3, he and Bay both stated it sucked.